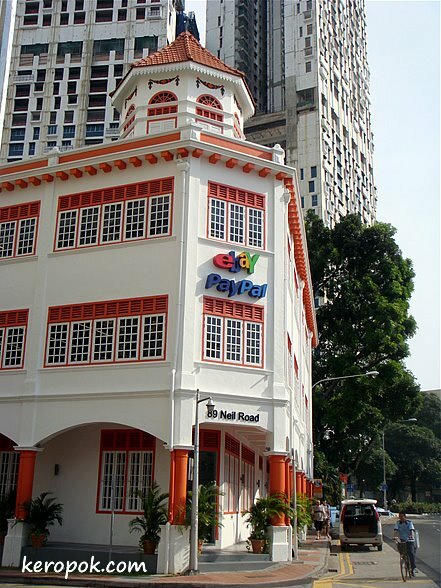 Oh, I never thought that Singapore would have it's own office for EBAY and Paypal but of course it makes sense. I've never seen an ebay office before! I guess they have to have one! Wow, I never know they have offices here. Cool. good shot. traditional attic top against modern buildings - juxtaposed. thanks for visiting and dropping a note. i wonder how their office look inside. the outside looks too clean! maybe we shall go visit the inside of it eh? one of these days..
the modern building behind is under construction and will be the tallest public housing in spore! I know a lot of people who do but I don't use eBay or PayPal. I have bought and sold some stuff via newyork.craigslist.org. I prefer craigslist because it's local and you can meet the person, inspect the product and then make the purchase. I sold my old digital camera to a mechanic who was trying to get into the used car business. He wanted a simple used digital camera to take photos of his cars. I also bought a gently used Jack Spade bag from a guy who bought it but ended up wanting something bigger. I have neved used eBay nor PayPal. And I am glad I am reading Ming's comment: I have thought of selling some stuff on Craigslist but never came around doing it.